Jack Murphy, right, performs a single leg takedown against his Mt. Sac opponent. Along with the battles on the mats, the Bakersfield College wrestling team is facing its own battles with making weight classes and staying healthy. 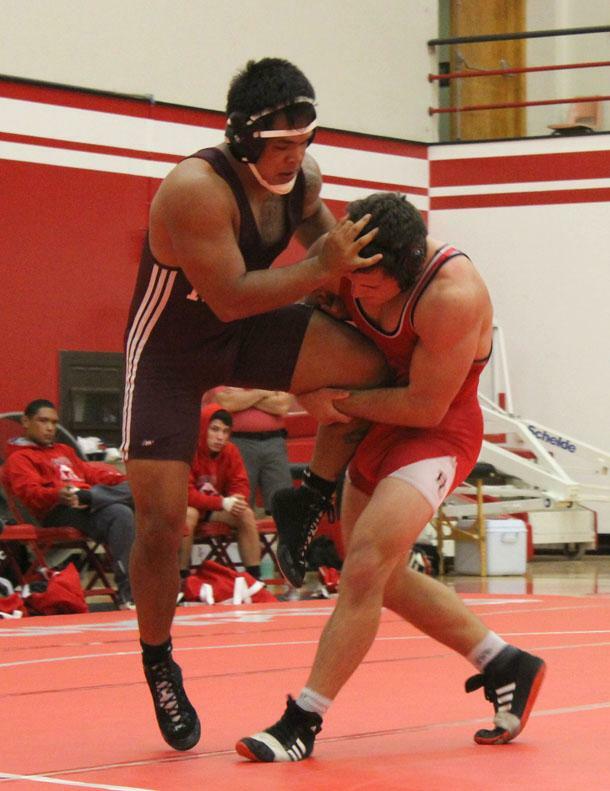 At the annual Bakersfield Duals, BC managed to key in on some valuable individual points but failed to do so as a whole unit, dropping all three team matches. However, BC’s Cesar Luna, at 184 pounds, and Jack Murphy, at 197 pounds, really stood out and came out on top three times in each of their respective weight classes. Luna, who won all three of his matches including a vigorous 11-3 major decision over Alcatar from Mt. SAC, finished his day with an 11-7 victory over Santa Ana’s Gabe Hernandez. Murphy followed suit with his defeat over Anthony Briones of Mt. SAC in an 8-3 decision match. Where Murphy really impressed spectators was his dominating 19-7 major decision match against East Los Angeles’ 197-pounder Guerro, and his pin on Santa Ana 197-pounder Fraser in the second period of the final match. For future matches Coach Joe Espejo stated he just wants to get everyone physically healthy and have their full line up.